At Marseli, we are all about helping you improve your sales and marketing performance in a very unique way. Improving your sales and marketing performance right, starts with diagnosing your business right! Getting some fact and not acting on opinion. That's why we will perform our exclusive multi-point health check service of your sales and marketing teams, CRM adoption and CRM data quality before we make any recommendations. We have the technology and the expertise to pin-point the root of your performance challenges to help you focus on what needs fixing. We can also tell you what is working well and what you should capitalize on. Here’s how it works. It’s a lot like taking your car to the service center. Every car has a computer that gets plugged into a diagnostic system. Your car happens to be your Salesforce.com system. 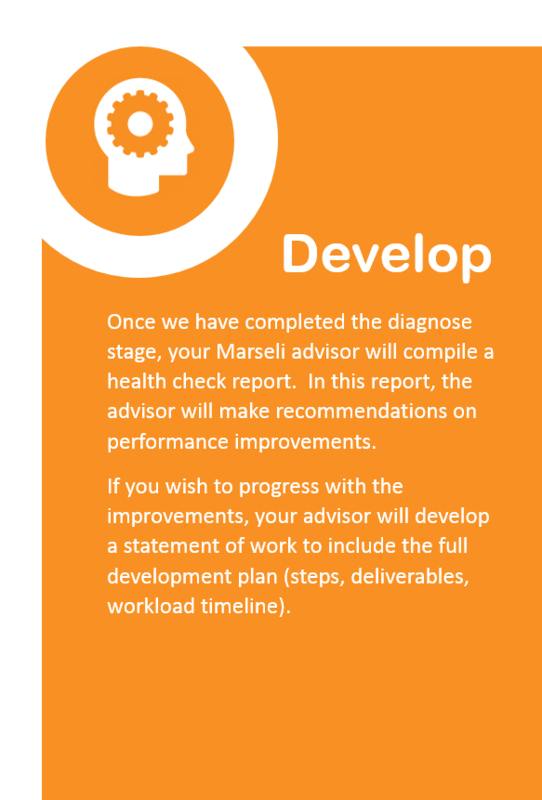 The diagnostic tool happens to be Marseli for Salesforce.com. If you don’t use Salesforce.com, its ok, we would use a more traditional interview methodology to collect the data. We plug Marseli into your SFDC system (takes about an hour). We run the diagnostic test and compile the report. We review the results with you. We provide you with a statement of work that will outline what it would take to act on the results. You then have the option to select to have Marseli partner with you to do the work. Reach out to us today to see how we can help you improve your sales and marketing performance.